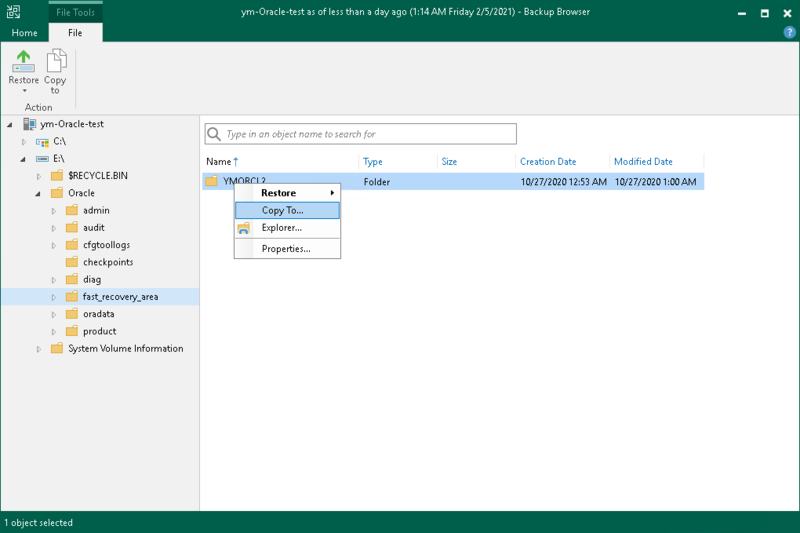 After the restore process is complete, Veeam Backup & Replication will open the Veeam Backup browser displaying the file system tree of the restored VM. Note that names of the restored VM hard disks may differ from the original ones. After the restore process is complete, close the Veeam Backup browser. Veeam Backup & Replication will add the RESTORED- prefix to the original file name and store the restored file in the same folder where the original file resides. If the file with the RESTORED- prefix already exists in the original location, Veeam Backup & Replication will name the restored file in the following format: RESTORED-<filename>__YYYYMMDD_HHMMSS. To save restored files or folders to a folder on the backup server or in a network shared folder, in the Veeam Backup browser right-click a file or folder and select Copy To and select a location to which the file or folder must be copied. Select the Preserve permissions and ownership check box to keep original ownership and security permissions for restored objects. Veeam Backup & Replication will copy files and folders with associated Access Control Lists and preserve granular access settings. Leave the Preserve permissions and ownership check box not selected if you do not want to preserve original ownership and access settings for restored objects. Veeam Backup & Replication will change security settings: the user who launched the Veeam Backup & Replication console will be set as the owner of restored objects. Access permissions will be inherited from a folder to which restored objects are saved. If you are restoring VM guest OS files of the virtualized Microsoft Active Directory Server, Microsoft Exchange Server, Microsoft SharePoint Server, Microsoft SQL Server, you can launch Veeam Explorer for the necessary application directly from the Veeam Backup browser. 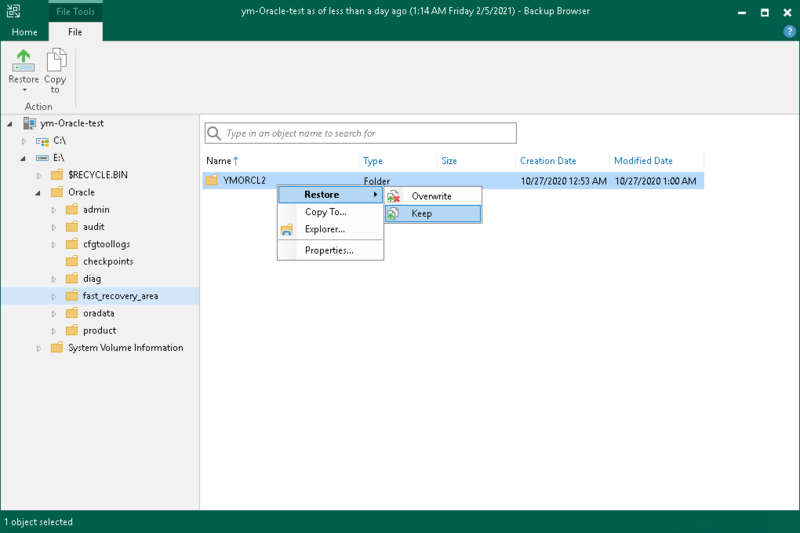 To start Veeam Explorer for Microsoft Active Directory, browse to the Microsoft Active Directory database file (DIT) in the Veeam Backup browser, select it and click Application Items > Active Directory Items on the Home tab or double-click the DIT file. To start Veeam Explorer for Microsoft Exchange, browse to the Microsoft Exchange database file (EDB) in the Veeam Backup browser, select it and click Application Items > Exchange Items on the Home tab or double-click the EDB file. To start Veeam Explorer for Microsoft SharePoint, browse to the Microsoft SharePoint content database (MDF) in the Veeam Backup browser, select it and click Application Items > SharePoint Items on the Home tab or double-click the MDF file. To start Veeam Explorer for Microsoft SQL Server, browse to the Microsoft SQL Server database file in the Veeam Backup browser, select it and click Application Items > SQL Server Databases on the Home tab or double-click the Microsoft SQL Server database file. For more information, see Microsoft Docs. In the Veeam Backup browser, click Explore on the ribbon or right-click the necessary folder and select Explore. Veeam Backup & Replication will launch Microsoft Windows Explorer. Browse to the necessary VM guest OS files. You can also start Microsoft Windows Explorer from the Start menu of Microsoft Windows and browse to the necessary VM guest OS files. VM disks are mounted under the C:\VeeamFLR\<vmname>\<volume n> folder on the backup server. You can browse restored files and folders only while the Veeam Backup browser is open. After the Veeam Backup browser is closed, Veeam Backup & Replication unmounts VM disks from the temporary VM. It is recommended that you close the Veeam Backup browser after you finish restoring files and folders. Veeam Backup & Replication checks if there is any activity in the Veeam Backup browser every 5 minutes. If the user or Veeam Backup & Replication components and services do not perform any actions for 30 minutes, Veeam Backup & Replication displays a warning notifying that the Veeam Backup browser will be closed in 5 minutes. You can click Cancel to postpone the close operation. The Veeam Backup browser will remain open for 5 minutes. After this period expires, Veeam Backup & Replication will display the warning again. You can perform no action. The Veeam Backup browser will be automatically closed in 5 minutes.